Is LG planning an even more flexible G Flex 2? 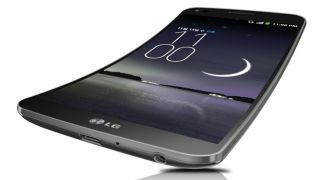 LG's not resting on anybody's laurels with word that it is speccing out the LG G Flex 2 and wants to give the handset a screen that can bend almost 90 degrees. That's tiptoeing into foldable territory, with the handset supposedly set for a hard rubber body to accommodate the bend. ZDNet Korea reckons that LG is already planning mass production for the G Flex 2 which suggests that we'll see the handset launch at some point in 2014. Samsung is also looking at the folding phone market and seeing dollar signs, with a foldable prototype doing the rounds as well as this crazy 3-sided phone patent on its books. LG's not letting anything official slip about the G Flex 2, however, so all we have to go on for now are these supply-chain rumours. We recommend them only as part of a high-sodium diet. Will the LG G Flex 2 make it into the top 20 mobile phones in the world?